Manager David Tuttle has left his post at Millwall by mutual consent. Tuttle took over as Lions boss from Colin Lee in December, but he failed to prevent the South London club from being relegated from the Championship. He told the club website: "I am very disappointed we have not been able to avoid relegation, but I thank the staff and players for giving it their best." Goalkeeping coach Tony Burns and Alan McLeary will take charge for the remaining games with Burnley and Crewe. A statement on the club website said that Tuttle is keen to further his career in management elsewhere and chairman Peter de Savary has pledged his full support to assisting him to further his ambitions. Burns has been asked to remain in his current role for the next two seasons but will oversee first team affairs until the end of the season. 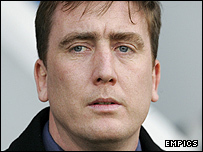 The 33-year-old was the youngest manager in the Championship and had never managed a professional club before. He won only four of his 22 matches in charge, drawing nine and losing nine on his way to relegation. Tuttle added: "I would like to thank the fans for the way they have supported the team during a very frustrating season and I wish the club every success in the future."